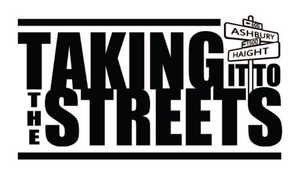 Taking it to the Streets San Francisco exists to empower homeless youth and provides opportunities for housing, employment, and mentorship. We work with youth who are ready to turn their lives around and get off the streets for good. Our clients receive the support they need to realize their life, education, and career goals so that they can take agency over their own future. This in turn supports the local community by providing a cleaner, healthier, and happier place to live for everyone. Our organization is a way for Haight-Ashbury and Cole Valley residents to work together to create a more connected and sustainable community. Our “sweepers” literally sweep the streets and provide graffiti abatement in the Upper Haight and Cole Valley. The sweepers work 5 days a week, 6 hours a day in exchange for free housing. Youth in the program receive valuable job skills, counseling, and support to realize their personal goals. While many youth are interested in this program, only a handful are selected to participate. Our organization selects youth that demonstrate over time their ability to keep agreements and show motivation to get themselves off the streets. Currently there are 35 sweepers enrolled in the program, 10 of which have jobs and are transitioning to live independent of our program’s support.